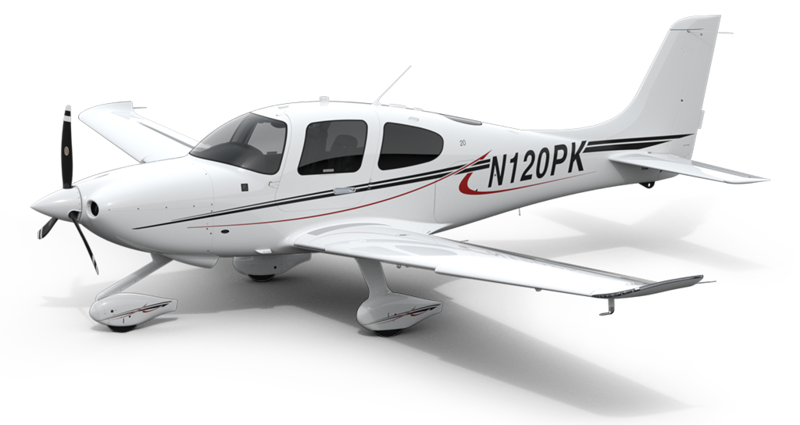 The 2019 SR20 Premium includes the Digital 4-in-1 Standby Instrument, providing backup altitude, airspeed, attitude, and slip/skid data in a format familiar to glass cockpit aviators. 12” screens offer tremendous situational awareness and 35% more screen real estate over the standard 10” screens. Active Traffic enhances the standard ADS-B In Traffic with active interrogation of nearby transponder-equipped aircraft to create a 360° zone of detection and awareness around the aircraft and provides visual and ATC-like audio alerts to potential traffic hazards. Remote keyless entry and interior/exterior ambient convenience lighting ease evening preflights and the Carbon, Platinum and Rhodium Design Suites ensure that you’ll arrive in comfort and style, no matter where your Cirrus takes you. Premium leather and bolstered seats maximize cruising comfort, and striking exterior designs reflect your personality on the ramp. Inspired by the unmistakable style of the most legendary sports cars, the Carbon Appearance design suite utilizes a new palette of colors that delivers a stunning tarmac presence. Interior details such as jet black vents, carbon fiber instrument panel lobes and two-tone premium leather bolstered seats complete this exhilarating look. Give yourself and your investment the peace of mind that during the first 3 years or 1000 hours of ownership, if any system in your aircraft needs attention, Cirrus will take care of you.